They are all wrong. Sadly, completely, unquestionably – wrong. Curmudgeons are often wrong; they probably don’t mind being wrong. They are curmudgeons and are entitled to be wrong because their role on this orb is to hold and to express eccentric opinions. Brilliant curmudgeons have their admirers. I admire them. But I am surprised to be told that I ought to look to Whitman or Twain or Freud or Charlie Chaplin as Elizabethan-Jacobean experts. Many who believe in the authority of these curmudgeons are evangels in this conviction. Wicca, No-Poet-Shakespeare, Methodism are all evangelical belief systems. In the New Faith, we are to overlook that Twain might not have agreed with Freud on anything. Never mind, you drunked-up sinner. Believe in Twain! Believe also in Freud! They are scientists of literature, are they not, for they opined, did they not, to the same end about no-poet-Shakespeare? Join in the Faith. Join, too, in the Practice. The practice of the faith-based anti-Strafordians is the insertion of a remark by Twain or Freud, when authentication by way of fact or document is most needed. This is a stratagem grounded in devotion rather than research. We called it proof-texting in West Virginia, where I grew up. It is not scholarship. It is not research. At fourteen years old, I knew I was not a scholar; I knew I was not conducting research, when I cited proofs from Biblical texts, conveniently packaged in a pamphlet, so as to unfold The Plan of Salvation. It’s my opinion that Shakespeare wrote these lines after he had died. Twain’s opinion that Shakespeare was dead when he wrote his one poem is not sufficient evidence to those biased, pesky scholars, who suspect that fact-based research, not faith-based opinion, is the first and the last defense against ignorance. Today, aided by books10 and websites,11 the anti-Stratfordian assertion that Shakespeare did not write Shakespeare has become a question that answers itself. Yes. 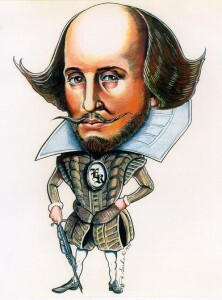 Shakespeare wrote Shakespeare but Shakespeare was a pen name, a screen behind which a socially-connected-well-educated-person-who-wished-to-remain-unknown wrote the plays, and the sonnets, and the poetry. The anti-Stratfordian proposition has a circularity about it: the works attributed to Shakespeare were not written by Shakespeare but by someone else, who called himself Shakespeare. In a later article, I will look at the supposed Shakespeare biographical data, much of it anecdotal material, but which anti-Stratfordians insist points decisively away from the Stratford actor as the Bard. For the moment, we will look at the various spellings of the well-known surname, Shakespeare. This exercise is required because of the anti-Stratfordian assumption that variable spelling is evidence of a pen name. Under this rule of orthography, invented for the occasion, one version of the surname arbitrarily stands for an actual person, whose background disqualifies him as a playwright or poet, while a slightly different spelling, also selected arbitrarily, is a pseudonym for a different person, whose background is better suited for the author of the Shakespeare corpus. Shaksper(e) versus Shakespeare is a simplistic face off, intended to bolster an obtuse argument, which otherwise cannot be bolstered at all. In 1604, the Hamlet play was printed again, at twice the 1603 size, and this time with the author identified15 as William Shakespeare. In this 1604 printing, the drama is described as “newly imprinted and enlarged to almost againe as it was, according to the true and perfect Coppie.”16 So, within twelve months of an earlier printing, Hamlet is again published, but under a differently spelled author’s name and at twice the length of the earlier printing. Shapiro also points out that spelling decisions were the prevue of the printer19 and in the 1590s and into the 1600s, a play’s text became the property of the acting company that produced it.20 Those who find it implausible that Shakespeare wrote Shakespeare because of the various spellings of the surname ought to answer James Shapiro. In many instances at this time and place, the name of the author of a play might not appear on the title page at all. Shapiro points out that Titus Andronicus was published in 1594 with no mention on the title page of the author.22 This being so, how can Edward de Vere or anyone else have elected to publish under a pseudonym, whether Shakespeare or Shake-speare – when, in many documented instances, no one was identified in the printed copy as the author? Variations in spelling can be seen as important only after an assumption is made. The assumption is that variable spelling means a pen name could have been adopted. But this assumption is contradicted by what is known about play writing in England at this time. In the case of Shakespeare, there is no historical evidence for the assumption. The often repeated rhetorical flourishes about differences in surname spelling are simply irrelevant to the question of authorship. Shakspeyr . . . Shakespeare . . . Shakyspere . . . Any one of these documented surname spellings suggest themselves with as much pride of place as Shaksper/e, the name adopted by anti-Stratfordians, as the rube from Stratford who could not be the London Bard. The plain fact is: there are many spellings of the name, Shakespeare. On what basis is one surname spelling to be preferred and another deemed to be a pseudonym? “Gulielmus Shaksper” was christened on April 26, 1664, with the event recorded in Latin.26 But in the century prior to the birth of the baby bard in 1564, half a dozen surname variations are found in use in Warwickshire, the shire which encompassed the towns of Warwick, Stratford, Snitterfield, among others. A document entitled “Register of the brothers and sisters of the guild of Saint Anne of Knolle” offers an assortment of surname spellings, from the year 1407 until the guild was disbanded in 1535.27 Following the usages found in the Register, we might decide to call our Warwickshire poet Shakspore (c. 1440) or Schakespere (c. 1464) or Schakespedre (1476) or Schakespeyre (1476) or Schakepere (1505) or Shakespere (1527), or Shakspere (1527). The fact that Shaksper appears in a Latin notation in a parish baptismal record book in 1664 says nothing at all about how the baptized baby might have spelled his surname, or if at any point in his life, he greatly cared. Nor can this notation be used to suggest that a later variation, Shakespeare, crops up first in London as a pen name for a different person. In fact, Shakespeare is not a later variation, nor is it first found attached to literary or dramatic works published in London. On May 1, 1602, in Warwickshire, a conveyance of land was recorded whereby Gilbert Shakespeare, brother of the poet, received a deed for 107 acres of land “to the use of the within named William Shakespeare,” purchased from William and John Combe.33 There is an endorsement on this indenture which reads, “Combe to Shackspeare of the 4 yard land in Stratford fielde” which Halliwell suggested could be in the poet’s own handwriting.34 On March 5, 1610, Gilbart Shakesper signed his name as witness to a lease of property on Bridge Street, Stratford.35 On Feb 3, 1612, Gilbertus Shakspeare was buried, according to the Stratford register.36 These samplings are among many spelling variations, all of which point to inconsequential diversity. The same can be said for variations when they appear in print in London. Such a notation does not make Shakespeare the writer of plays, but it does mean he was known in London under his own name, and was sought out and reliably accepted as a witness by a government agent, whose job included keeping track of who wrote what. No records have surfaced which suggest that the royal censor associated anyone with Shakespeare’s works but William Shakespeare of Stratford-upon-Avon. All of these documents indicate that in Stratford and in London, the surname, Shakespeare and its many spelling variations are found in the poet’s lifetime, with reference to the man who had come to London from Stratford and to the man who authored the plays of Shakespeare. There is every reason to believe these references are to the same person. No evidence exists, which suggest some spelling variation is meant as a pseudonym. An inquiry into the authorship of the works of Shakespeare is an inquiry into history. This is an inquiry which anti-Stratfordians resolutely avoid, believing, apparently, that questions of authorship depend not upon facts but upon the marshalling of opinion.42 The known facts, which include a tabulation of the spelling variations of the name of the Bard, point to Shakespeare himself as the author. A different conclusion is reached only by substituting opinion for inquiry, which is a gambit that distorts the history. 1“Several suppose . . . that his name is akin to a myth, and that he wrote no plays at all!” Sir James Prior, Life of Edmund Malone, Editor of Shakespeare (1780-90), quoted in Shakespeare The Man and His Works, Moulton (Boston: Sibley and Company, 1904) p. 268. For a run through of the fraudulent attempts in the 1790s, and subsequently, to invent facts about the life of Shakespeare see Contested Will: Who Wrote Shakespeare? by James Shapiro (Simon and Schuster, 2010 ) esp. pp. 10-13, 17-36, 64-67. 4Is Shakespeare dead? From my autobiography, Mark Twain, (Harper & Brothers, 1909) p. 35; see Anderson, p. 369. 5In addition to Anderson, p. 369, see Who Were Shake-speare? by Neal Allen (San Diego: Silverado, 1998) p. xi., and the many Anti-Stratfordian websites, such as the Shakespeare Authorship Coalition (http://doubtaboutwill.org/past_doubters), the Shakespeare Oxford Society (http://www.shakespeare-oxford.com/?p=119) and the Shakespeare Fellowship (.http://www.shakespearefellowship.org/hall_of_fame/swf_skeptics/Twain.htm). 10For titles, see previous notes, esp. 3, 4, 5. 11Among many websites, see DoubtAboutWill.org; Shakespeare-oxford.com; shakespearefellowship.org; Wapedia – Wiki: Oxfordian theory of Shakespeare authorship (1/7). 13I have added bold to highlight the fact that there is no significant difference between Shakespeare and Shake-speare, since these variations, most likely, were printers’ decisions. See below. 17I am pained to pull down the posthumous attribution of Shakespeare’s work to Edward de Vere, a distant cousin of mine; see All of the Above I, Richard Baldwin Cook (Nativa, 2007, 2009) pp. 245, 295, 320, 326. 22Id. See also William Shakespeare: A Compact Documentary Life, Samuel Schoenbaum (Oxford University Press, 1978) p. 188. 40Hudson, cxix; see also Schoenbaum’s Compact Documentary Life, p. 239. 42The Shakespeare Authorship Coalition has published on its website a Declaration of Reasonable Doubt About the Identify of William Shakespeare. The Coalition is soliciting additional signatures. See http://www.doubtaboutwill.org/declaration. If everyone in the world signed this Declaration, would we then know that William Shakespeare of Stratford-Upon-Avon did not write the Works? Sure, if historical truth is determined by counting noses, centuries later.